HOW MACHAN IS A SOLUTION OF THESE ???? 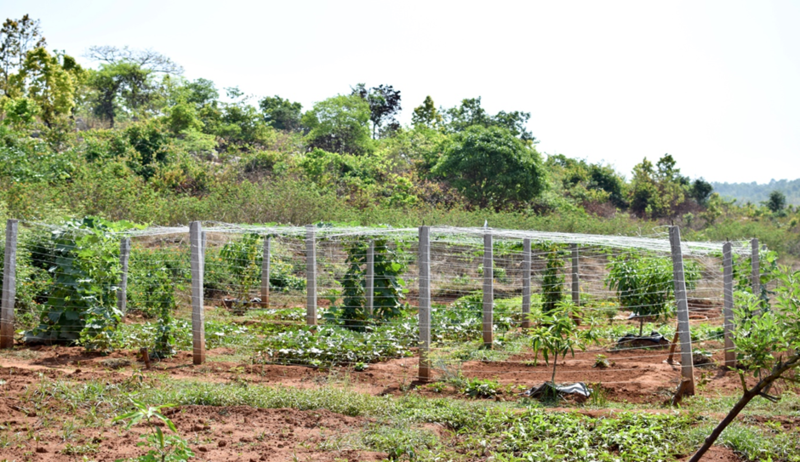 In Machan system cultivation the crops bear the fruit at least five feet from the soil. So the possibility of the attack of soil borne pathogens and insects is very less. If some attack occur, the application of pesticide is easier as the crops are clearly visible and hanging. In the pre pollination stage the flowers are lined up to the straight sunlight, it enhances the light phase of pre pollination stage and creates at least 80% successful pollination out of the total flower. The leaves of the crops flattened away horizontally on the rope and sting of the Machan. Greater exposure to the sunlight enhances the photosynthesis of the plants. You can spray both front and back side of the leaf. The fruits hang straight horizontally from Machan to the soil. So the geotropic movement of the fruits enhances the size and quality of the crop (Especially for bottle gourd). The other intercultural operations are easier. THE INOVATION ON TRIPLE TIRE MACHAN SYSTEM OF VEGETABLE CULTIVATION GOT SELECTED BY IIT-DELHI FOR INDIA-INTERNATIONAL SCIENCE FESTIVAL.